This pudding is one of my favourites and is perfect for entertaining. 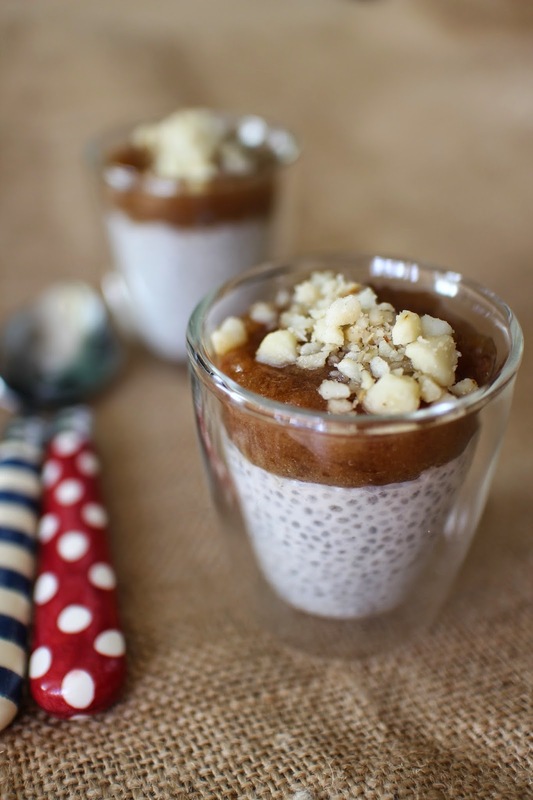 I just love chia seeds and this was the first time I had used the delicious maca powder. Maca powder is made from the maca root which grows in the Andes Mountains of Peru. Referred to as a superfood, it is revered for its wide-ranging benefits to the hormonal system and its aphrodisiac qualities. If you want to know more about the wonderful benefits of Maca Powder, the team at I Quit Sugar have put together a bluffer's guide to Maca. Mix all the ingredients together in a bowl, stir well and let rest for a few minutes. After a few minutes whisk together with a fork or metal whisk and place in the fridge to set for 3-4 hours or overnight. To make the caramel: blend all the ingredients until smooth and thick. Put this in the fridge for about 2 hours. Lightly toast the nuts in a hot pan then set aside to cool. Using a food processor pulse the macadamia nuts until they resemble a fine crumb unless of course you prefer a few chunky pieces. Spoon the chia pudding mix into individual serving dishes or ramekins, spoon a little maca caramel on top and sprinkle with macadamia crumbs. This tastes incredible and is you can enjoy it for dessert without any guilt. Everyone loves a guilt-free dessert. How pretty they look too. Confession time: I don't really like maca but I consume because I know it's healthy and also because I'm Peruvian... the stuff is cheap(er) back home! The pudding does look tempting.